It looks a bit like Gary Oldman’s portrayal of Dracula to me, but do you know what species this skull is from? As usual you can put your questions, comments and suggestions below. Good luck! Teeth root rodent to me. Bit like a guinea pig but longer shape. What size is it? From the yellow incisors I say rodent, but I can’t get any more specific even with the Dracula ‘do. They root rodent as well! If this is what I think it is, we had a breeding family group of them. Hot weather was a problem and one of them chewed the plug off my sewing machine, and that isn’t a criptic clue! I’d say vulture but I think the nostrils may be too low. Looks Rodent, but those Horn bud type processes have got me stumped. 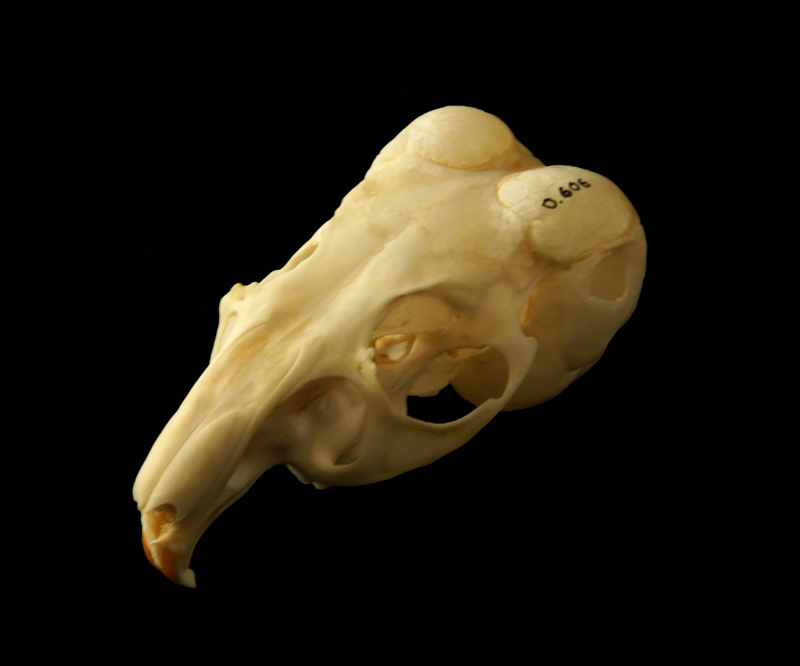 They are pretty unusual – they make this skull very distinctive indeed! A little representative of a native people? Used to be short tailed, now same genus and species name? Many years ago, after a long night out in Harrogate, I was woken about 4am as the household pet (not my household) had escaped. For a fat-looking rodent, it was very nippy. Mainly because it’s actually quite slender under that thick fur. Took 45 minutes to catch it. If I’m wrong, that story is wasted! Gosh, those things are a BUGGER to catch. It’s not the slenderness, its the speed at which they launch themselves. And the jumping. We have a few in the AMNH classrooms, and occasionally we like to let them run in pens with the kids. I wasn’t aware of the bumps – I have no idea why they have bumps – but I can tell you that scratching between the bumps is the best way to calm ours down after the chase. The jumping. Christ, I’d forgotten the jumping. Yes, thank you Claire …. Their fur keeps you warm but you might get a cold face. Unless you have a good beard – that’s the best protection against this wee beastie. we found the best way to catch them was with a couple of feet of cardboard tube from a carpet shop, they just could not resist hopping in. The best pets ever, except perhaps for the squirrel monkey, but that was a long time ago. my father always said they would make lovely gloves….but I think they’d be a little chilly….although indeed now that I think of it….a beard would indeed be useful. the bumps being tympanic bullae, are they as intensively acute listeners as the size of the “horns” would imply? yes, I googled too. But I don’t know…is that extraordinary? I think not. Yet the bullae seem relatively large. They seem to be attuned to lower frequencies than their size would suggest, which I think ties in with a larger cochlea. Usually, the smaller the animal, the higher the frequencies it can hear (e.g., humans: 12Hz to 20kHz; dogs: 40 Hz to 60kHz; mice: 1 kHz to 90 kHz; bats: 20 Hz and 120kHz. Perhaps this is due to its potential predators being large animals. If it is like Gary Oldman’s portrayal of Dracula – or of anyone/thing else, it must be a pig… the man is pure ham. Got it from everyone else’s clues !